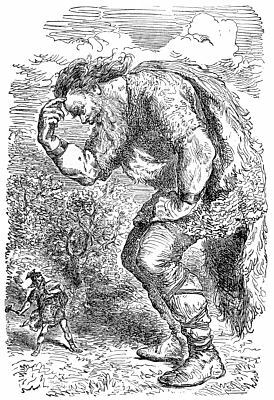 Þór and Loki decided to travel to Útgarð, land of the giants, the enemies of the gods. Early one morning, they left in Þór's chariot pulled by the two goats, Tanngnjostr and Tanngrisnr, and traveled to Miðgarð. That evening, they arrived at the farmhouse of a peasant family. The family offered night's lodgings, but they were too poor to be able to offer much food. 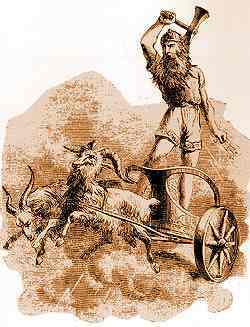 Þór slaughtered his two goats and put them in the pot. Spreading out the goatskins, he invited the family to enjoy the meal, warning them to be careful to throw all the bones onto the goat skins. However, Þjálfi, the young boy in the family, was so hungry that he could not resist cracking open the ham bone and sucking out the marrow. The next morning, Þór took his hammer, Mjöllnir, and raised it, blessing the goat skins. The goats, once again whole, stood up, but one of them was lame. Þór could see that someone in the peasant family had not treated the bones with proper care. Þór's brows furrowed with anger, and his hand gripped the shaft of his hammer so tightly that his knuckles went white. The peasant family begged for mercy, offering all of their poor possessions as payment for the wrong that had been done. Þór saw their terror and calmed down. He accepted as settlement the two children, Þjálfi and Röskva, to be his bond servants, and they have attended him ever since. Leaving the chariot and goats behind, the four travelers, Þór, Loki, Þjálfi, and Röskva, left on foot towards Útgarð. Coming to the sea separating Miðgarð from Útgarð, the travelers found a boat, which they used to cross to the other side. They continued on foot through the forest until evening. Þjálfi, the fastest of runners, went in advance of the other three, searching for lodgings, but none could be found. Together, they came to a curious hall. The entrance was as wide and as tall as the entire building. Inside, it was so dark and the hall so large that they could not see the far end of the hall. Nevertheless, they decided to take shelter there for the night. At midnight, the travelers were startled awake by an earthquake, and by groaning and rumbling noises from the outside. They withdrew further into the hall, finding that the hall split into a large room off to one side, and four smaller rooms continuing straight ahead. Þór stood guard at the entrance to the largest of the five rooms, while the others spent the night at the far end of the room in fear. In the morning, Þór, gripping Mjöllnir, left the hall to find a giant sleeping on the ground nearby. His snores were the cause of the shaking and the horrible noises they had heard the night before. The giant, awakening, stood up. For once, Þór was afraid to strike with his hammer. 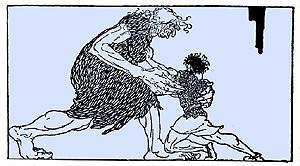 The giant introduced himself as Skrýmir, a dwarf among the giants. He picked up his glove from the ground. Þór then realized that they had mistaken the glove for a building, and that they had retreated into the thumb of the glove at midnight. The five agreed to travel together. They ate separate breakfasts. Afterwards, Skrýmir suggested that they share their provisions and offered to take their pack and carry it within his own. The five walked all the next day. Even Þjálfi, the fastest of the travelers, could not keep up with Skrýmir, but they could hear his crashing as he passed through the forest ahead, so they did not lose him. That evening found the five in an oak grove. Skrýmir decided to lay down and go directly to sleep, but invited the other four to help themselves to food in his pack. Þór worked at the straps, but no matter what he did, he could not untie them. Þór's anger grew as he realized that Skrýmir had not meant for them to eat from the pack. 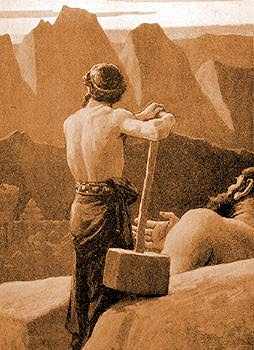 Taking up Mjöllnir, Þór stepped over to where Skrýmir lay sleeping and smashed the giant's head with the hammer. The giant sat up and asked, "Has a leaf fallen on my head? Have you eaten yet?" Þór replied that they were about to turn in, and found another oak under which to lie far from the giant. None of the four could sleep for fear and hunger. And Þór was anxious: this was the first time that the hammer had ever failed him. At midnight, the giant began snoring, shaking the ground and the trees all around. Þór rose again, and taking Mjöllnir, slammed the hammer down into the middle of the giant's head. Þór could feel the hammer sink into the giant's brain. Skrýmir sat up, saying, "What was that? Did an acorn fall on my head? And what are you doing over here?" Þór said he had been awoken, too, as he backed away to join his companions. He vowed to himself that the next time, he'd use Mjöllnir with enough force to send the giant to the depths of Niflheim. Just before dawn, Þór could hear that Skrýmir was once again fast asleep. He ran up to the giant and swung with all his might, crashing the hammer into the giant's head and burying the hammer up to the handle in the giant's brain. Skrýmir sat up, rubbing his cheek. "Are there birds up in that tree? I thought I felt some droppings fall on me. Are you awake, Þór? It must be time to get up." Þór was dumbstruck. As the five prepared to start their journey for the day, Skrýmir told them that they were near the stronghold of the giant king Útgarða-Loki, to the east. The giant said that he planned to continue to the north, so that he would part company here. Before leaving, he advised the four, "Keep your pride for your own kind, and keep your mouths shut. Útgarða-Loki's men won't stand for bragging from babies like you." Þór seethed at the insult, unable to do anything about it. Continuing, the giant said, "I'd advise you to turn around and go home." Then, without a nod or friendly word, Skrýmir departed and walked away to the north. All morning, the four travelers walked east. Eventually, they came to a massive stronghold. The walls were so high that they had to throw their heads back to their spines in order to be able to see the top. The gates were locked and unattended, but they were able to slip through them and enter the great hall of the stronghold. Giants of all ages lounged on the two benches. 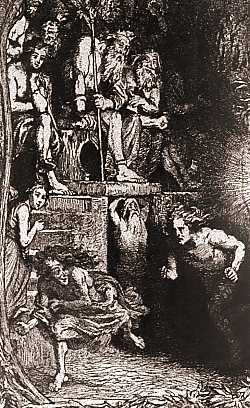 Þór and his companions made their way to the giant king, Útgarða-Loki, and courteously greeted him. The giant king slowly turned towards them, baring his teeth in a smile. "Am I mistaken in thinking that this little fellow is Þór the Charioteer? Maybe you're stronger than you look. In what skill do you excel? We never allow anyone to stay unless he is a master of some craft or pastime." Loki stepped forward. "No one can eat faster than I." 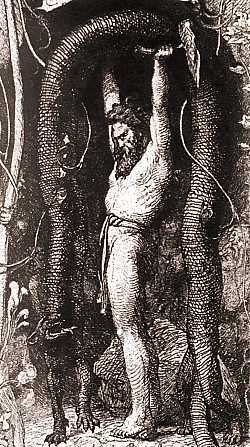 Útgarða-Loki called for the giant Logi to step forward to meet the challenge. Servants brought in a trencher and loaded it with meat. Logi sat down at one end and Loki at the other. At a signal from the king, they both began eating, meeting in the middle. While Loki had eaten all the meat, Logi had eaten the meat, the bones, and the trencher. He was declared the winner. Útgarða-Loki asked Þjálfi what he could do. Þjálfi volunteered to run a race against anyone in the hall. The company moved outside where a good course over level ground was laid out. Three times, the giant Hugi ran against Þjálfi. Three times, Hugi beat Þjálfi by wide margins. In the final race, Hugi was at the finish before Þjálfi reached the half way mark. Hugi was declared the winner. 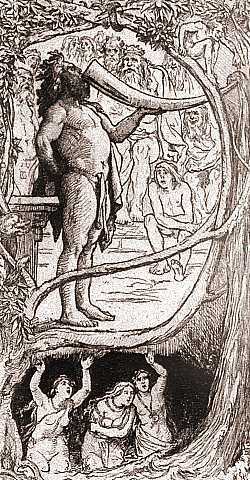 Útgarða-Loki turned to Þór and asked him which of his skills he would demonstrate, having heard great boasts of Þór's exploits. Ignoring the insults, Þór said that he could drink more than anyone in the hall. Immediately, a drinking horn was placed in Þór's hands. The giant king said that a good drinker could drain it in one swallow. Some might take two, but no one was so feeble that he couldn't finish it in three. Þór took three enormous swallows, each larger than the last. Each time, the level in the horn dropped, but never did the horn empty. Ignoring the taunting invitations to take yet another draft, Þór returned the horn to Útgarða-Loki. The giant said, "It's clear your might is not as great as we thought. Would you like to try your hand at another contest? Young giants perform the feat of lifting my cat off the ground. I wouldn't have suggested it unless I had seen that you're a much less impressive person than I thought." A cat jumped out from under the giant king's chair and planted itself on the floor. Þór put his arm under the cat's belly and lifted. The cat simply arched its back such that its four feet stayed on the floor. The giants laughed at the way the cat's effortless movements frustrated Þór. At last, Þór was able to lift the cat so high that one of its paws left the floor. "As I thought," said Útgarða-Loki. "Þór is short and small in comparison to the mighty men here in this hall." Þór, beside himself with his failures and the taunts and abuse, spoke. "Small as you say I am, just let someone come out and fight me. Now, I am angry." Útgarða-Loki, looking around the room, replied, "I doubt anyone would wrestle you; they'd feel it's beneath them." Then, continuing, the giant king exclaimed, "Find Elli, my old wet-nurse. Þór can wrestle her if he likes." The giants laughed as a horrible old crone entered the hall. She agreed to wrestle Þór. He threw himself at the woman, but she was stronger than she seemed. She stood firm and unshaken. Then she tried a hold or two on Þór. Catching him off-balance, she forced him to one knee. "Enough", cried Útgarða-Loki to Þór. "You've shown your true strength. There is no point in Þór's challenging any one else in the hall." Places were found for the four travelers. They were given food and drink and bedding for the night. The next morning, the four were the first to wake. As they made ready to depart past the sleeping giants, Útgarða-Loki intercepted them, showing them every courtesy. He gave them food and drink, and then escorted them through the gates and into the meadow outside the stronghold. Útgarða-Loki said, "This is where I must leave you. How do you feel things turned out? Have you met anyone more powerful than I?" Þór replied, "I've come off second best. You've put me to shame. I have never suffered greater loss of face. It irks me to know that you will say to all that I am a person of little accord." The giant said, "Now that we're outside the walls, I'll tell the truth. You'll never see the inside of these walls again. Had I known how strong you were, I'd have never let you inside in the first place. You were nearly the end of us all. "I have deceived you. It was I who met you in the forest. I used wires to fasten the pack so you couldn't open it to get food. I placed a hill between my head and your hammer that you couldn't see. Those three square valleys you see behind the ridge were the marks you made in the earth with your hammer blows when you tried to hit me. "Loki ate fast, but Logi was wildfire itself. He burned up the trencher and the meat. When Þjálfi ran against Hugi, he ran against thought. Nothing can keep up with the speed of thought. "When you, Þór, drank from the horn, you thought you were found wanting. But the other end of that horn connected to the sea. When you get back to the ocean, you'll see how much it has ebbed from your efforts. "And the cat was not what it appeared; it was Jörmangandr, the Miðgarð serpent. You raised it up off the sea bed so high that its back grazed the sky. "And it's a marvel that you withstood Elli for so long. Elli is old age. No one can withstand old age in the end. "Here is where our ways part. It will be better if you never visit again. I have used tricks, and I'll use them again to protect Útgarð so you'll never be able to harm us in any way." Þór snatched up Mjöllnir and swung it over his head for a killing blow to Útgarða-Loki. But it was for naught. The giant had vanished. The stronghold disappeared, too, leaving only a wide and beautiful landscape. There was nothing but the three square valleys next to the hill, and the ebb and flow of the tides in the ocean to indicate that any of this had taken place. 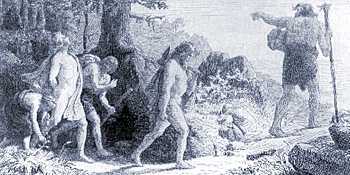 The four travelers returned to Miðgarð. Þór retrieved his goats and chariot, and the four returned to Ásgarð. But Þór made up his mind to seek another meeting, both with the giants, and with the serpent Jörmangandr. This story presents yet another example where Þór is completely outclassed by an adversary in verbal and language skills. Þór and his companions don't realize that the names of their opponents describe their attributes. The word logi means "fire", and hugi means "thought", and elli means "old age". Had they had any skill at all in the verbal arena, Þór and his companions would have known against whom they were competing.